In Zimbabwe, there are quite good conditions for starting a business in the field of voip termination. Zimbabwe has one of the highest rates of cellular penetration among African countries, which is about 95%. A fairly high rate (an average of $ 0.1 per minute ) allows the terminator to earn over $100 from only one channel of equipment. But for a stable income generation, it is important to provide a reliable high-speed Internet connection. With the rapid development of the mobile market, Zimbabwe has not developed Internet services sector much. As of March 2017, the penetration rate of the Internet reached 42% (this is about 6.8 million users). Such a low rate is primarily associated with high prices for services. According to a report published by Research ICT Africa, in September 2016 Zimbabwe took the fourth place in the list of the most expensive countries in terms of the cost of mobile Internet. One gigabyte costs $30 here. The cost of WiMax and fiber-optic connections is over $60 per month, while the data transfer rate is from 1 to 3 megabits per second. The cost of a package with unlimited Internet access and a speed of up to 20 Mbps is $149 per month. For efficient GSM termination, 1-3 Mbit/s will only work if you install the equipment that has a small number of channels. 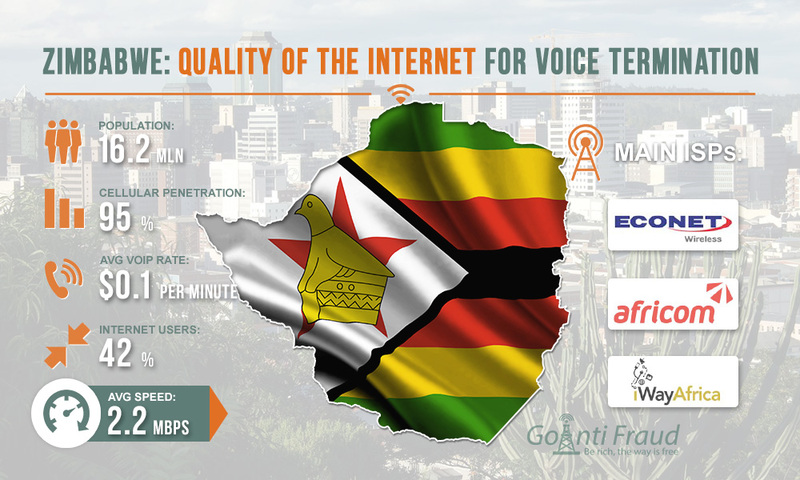 In Zimbabwe, there is Internet connection that is not a very reliable but you can improve its quality by using the SBO optimization module from GoAntiFraud. It allows you to compress Internet traffic in 3 times, thereby providing increased network bandwidth and savings in payment for services (in the case of a billing per megabyte). Our customers also have access to proven tools to bypass Antifraud, workflow automation software, and comprehensive channel work statistics. In addition, GoAntiFraud users are provided with useful educational materials, including articles with infographics, video instructions, goip 4 manual, Case Study on working with the service, etc.